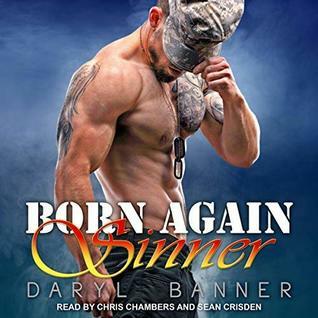 Review: I think I picked this audio up because of the narrators. Sean Crisden is a fan favorite and I rarely pass his audiobooks up, but Chris Chambers is new to me and I LOVED his voice. That soft southern twang just about melted me. I am not normally affected by anything remotely southern, but his impersonation and performance of Trey was so soothing that I kinda want to meet him in person so I can let that honey voice just sink into my soul. Okay, enough fan girling. Cody is suffering from PTSD from his time on the battlefield and missing his team. Trey is the man hired to assist him at home, even though Cody goes to extremes to keep him out. Cody was simply awful at first, but you understood why, and fortunately, Trey didn’t scare easy. These two, once Cody got over wanting him gone, and instead simply wanted him, were fantastic. They were so good together and you just knew that the stars aligned because they completed the other. Chris Chambers’ performance of Trey left me smiling, even when he struggled with his religion and his pastor father. But, Trey is not a pushover. He is respectful to his father but doesn’t allow him to get away with being a hypocrite. I loved that part. Sean Crisden displayed his typical expertise in performing Cody. Even though his voice reminds me of so many other characters he has performed in the past, he still allows the reader to remain in the moment in the current story. Truthfully, I am unsure if it was the story or narration, but whatever it was, this worked for me and I recommend this audio to everyone.